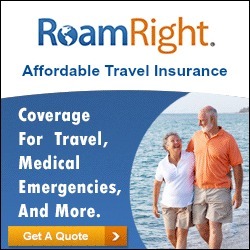 We offer travel insurance through RoamRight, a division of Arch Insurance Company. We include $500 coverage in your tour price and you are welcome to upgrade to cover the full tour premium. This will be automatically added to your invoice if you request the upgrade. To calculate the cost of the tour insurance: (land cost + air cost – $500) x 6.14%. For any questions about coverage, please call Roam Right at 1-866-891-6614 and tell them that you are interested in the Professional Plan.